Colorado Springs and surrounding area and on occasion area within Colorado. I work on a reward basis, you pay what it's worth to you and what you can afford for me to find your lost item. No charge for active duty military personnel. I have a minimum $25 fuel fee for my expenses in the local area, even if the item is not found. If the distance is greater than 25 miles, the amount is negotiable. Parks, Schools Ball Fields, Beaches, Private property with written permission or owner present, Jewelry, Rings, metal valuables, property markers and anything made of metal. A few years after retiring as an Electronic Engineer and Mathematician, in 2000, a friend introduced me to metal detecting which has become an exciting avocation. Most of my detecting activity is in parks. 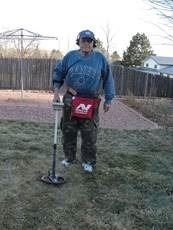 I am an active member of the Pikes Peak Adventure League (PPAL) in Colorado Springs which is a club consisting of metal detectorists. Thru PPAL, on occasions, I have assisted law enforcement officials in locating weapons used in a crime. When the owners of lost rings that I detected could be located, they were returned to the owners. In addition my wife and I have located some property markers to help the owner know the boundaries . Since I am retired I am available most of the time.